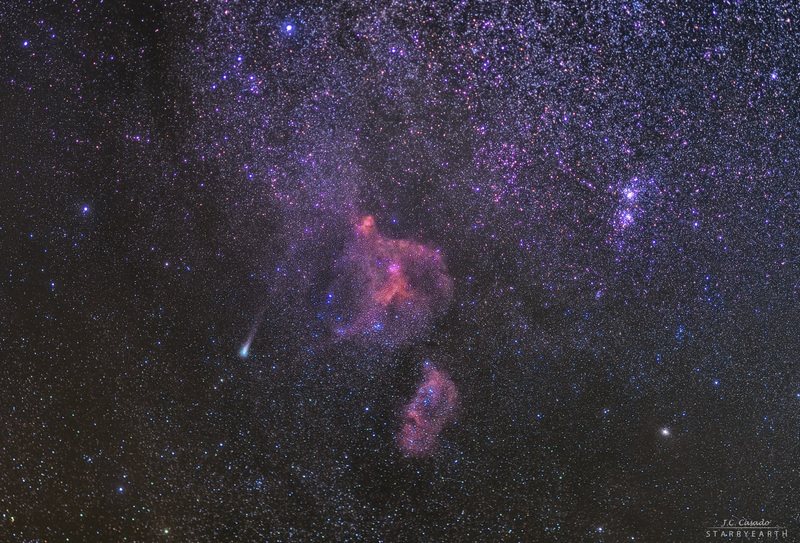 Explanation: The greenish coma of comet 21P/Giacobini-Zinner stands out at the left of this telephoto skyscape spanning over 10 degrees toward the northern constellations Cassiopeia and Perseus. Captured on August 17, the periodic comet is the known parent body of the upcoming Draconid meteor shower. Predicted to be at its brightest next month, the comet is actually in the foreground of the rich starfield, only about 4 light-minutes from our fair planet. Giacobini-Zinner should remain too faint for your eye to see though, like the colorful Heart and Soul nebulae near the center of the sensitive digital camera's field of view. But the pair of open star clusters at the right, h and Chi Persei, could just be seen by the unaided eye from dark locations. The Heart and Soul nebulae with their own embedded clusters of young stars a million or so years old, are each over 200 light-years across and 6 to 7 thousand light-years away. They are part of a large, active star forming complex sprawling along the Perseus spiral arm of our Milky Way Galaxy. Also known as the Double Cluster, h and Chi Persei are located at about that same distance. Periodic Giacobini-Zinner was visited by a spacecraft from Earth when the repurposed International Cometary Explorer passed through its tail in September 1985.